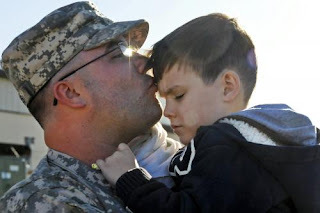 SPaul note: We see time and time again the tears of reunion when a father or mother serving in our military comes home and their children rush to their arms with a flurry of desperate hugs and kisses pouring out from lonely hearts and lost days of their childhood. These little Americans do not understand the heroic actions of their parents in these dangerous times; they only know they have so very desperately missed half of their hearts for too long. In the political game of War, the powers that be do not concern themselves with such trivial things as children's tears or broken homes because a parent has either been killed in action or has been deployed for too long. They only care for things that create more power. We the People however, understand all too well the pain and struggle of a loved one going to "defend" our Nation and having to face the fear of losing them each and every day. The initial mission has been accomplished: bin Laden is dead. It is time to bring these brave men and women home and make our country whole again. On May 1, the U.S. president addressed the nation, announcing a military victory. May 1, 2003, that is, when President George W. Bush, in his form-fitting flight suit, strode onto the deck of the aircraft carrier USS Lincoln. Under the banner announcing “Mission Accomplished,” he declared that “major combat operations in Iraq have ended.” That was eight years to the day before President Barack Obama, without flight suit or swagger, made the surprise announcement that Osama bin Laden had been killed in a U.S. military operation (in a wealthy suburb of Pakistan, notably, not Afghanistan). Lee acknowledges that Obama “did commit to begin a significant withdrawal in July.” But what does troop withdrawal mean with the presence of military contractors in war? Right now, the 100,000 contractors (called “mercenaries” by many) outnumber U.S. troops deployed in Afghanistan.